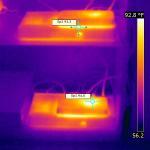 Posted: Thu, 04 Apr 2013 21:06:02 Post Subject: My Tuners Get Hot! Just playing with the thermal imager. if it can talk, might as well say "can you feel the heat?" This is my TV during the World Cup.